You get 3 feather refills in this pack. 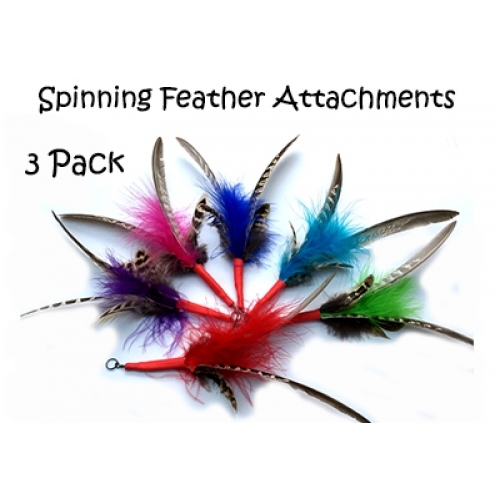 The PurrSuit Feather attachment spins through the air simulating a flying bird and for your cat look and sound like the real thing. Wonderful sound of the feathers as they fly/spin through the air will have any cat go completely crazy!! They are made with two main pheasant flight feathers which provide a spin, natural Pheasant flank feathers and a colourful Turkey marabou feather which provide the bling. Feathers are fixed by a special tubing to stop the feathers coming out. The feathers used are sourced in the UK in accordance with the Wildlife & Countryside Act 1981 from Free range British Birds that are free to lead a natural outdoor life before entering the British food chain. They can be used with the PurrSuit, Da-Bird or the Frenzy wands. Various Colours & size of feathers. To complete a cat's natural hunt, catch, kill, eat cycle, use the PurrSuit Flyer, Frenzy or DaBird wands and refills as hunt/chase exercise toys and some cat treats for afterwards to complete the cycle.